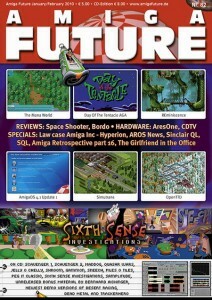 AmigaOS 4 Update 1, Maniac Mansion – Day for the Tentacle, Space Shooter, Bordo, SimuTrans, The Mana World, Open TTD, Reminiscence. You can take a look at the first page of the article in english or german. It contains only technical aspects (how to run it) and a neutral description of the game but no evaluation/critic. coder/patcher) who owns a copy, says that it’s a very kind review, with actual a deeper test (the review is spanning two pages). They have tested nearly all paksets and gave a very kind summary. This entry was posted on 2010-01-11, 23:29 and is filed under Media. You can follow any responses to this entry through RSS 2.0. Both comments and pings are currently closed. Simutrans rules – I used to love playing games like A-train and TTD on the Amiga, so finding Simutrans on the PC was great for me. I played OpenTTD for a while before I discovered Simutrans though. I spent some time reviewed and compared both games at length, although since both are changing I do have to keep up.